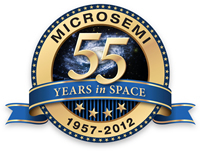 Microsemi has a longstanding commitment to the space market and has played an important role in hundreds of global initiatives over the past 55 years. The company's high-reliability products are designed for applications that require high levels of radiation hardness, and have been used in trips to the Moon, Mars and beyond. Microsemi's roots date back to some of the earliest rocket programs including the Atlas, Delta and Titan initiatives of the late 1950s, and on through the Agena, Polaris, Poseidon, Mercury and Centaur missions of the early 1960s. The company also played a key role in the Surveyor and Apollo and Saturn Rover missions of the late 1960s and early 1970s, and during the past two decades has provided enabling technology for the international space station, Mars Rover, Mars Science Lab and Cygnus programs. With one of the industry's most comprehensive portfolios of space products, Microsemi provides radiation-hardened and radiation-tolerant solutions ranging from diodes, transistors and power converters, to FPGAs, ASICs, RF components, custom semiconductor packaging, and integrated power distribution systems. The company is committed to supporting its products throughout the lifetime of its customers' programs, and delivers ongoing innovations in such areas as semiconductor materials, advanced packaging technologies, and high-density integrated circuits. 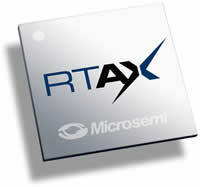 Among Microsemi's most noteworthy innovations are radiation-hardening-by-design techniques that protect its FPGAs against single event upset (SEU) radiation effects, as well as process advances using silicon carbide (SiC) and gallium nitride (GaN) wide band gap materials that have allowed manufacturers to reduce component count, size and weight while providing increased bandwidth and reduced operating temperature. 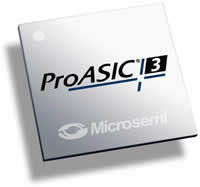 Microsemi also has extensive packaging expertise, including novel technologies for enabling integration of FPGAs into hybrids and multi-chip modules, plus multi-chip system-in-package technology for space-saving, reduced-weight, class K-compliant subsystems. Product reliability is extremely important to Microsemi and its customers. For instance, the company's products are qualified to the highest government, DLA, NASA and ESA standards, and multiple agencies have independently certified their reliability. Microsemi's RF and microwave devices are all screened to JAN class S requirements, and it's radiation-tolerant FPGAs feature QML qualification to classes Q and Y and have survived more than 26 million device-hours of independent reliability testing. Additionally, Microsemi's Phoenix, Arizona, facility is Defense Microelectronics Activity (DMEA) accredited as a trusted supplier of radiation-tolerant FPGAs, and the location is fully ITAR compliance and includes a DOD secure area. Microsemi also was the first diode manufacturer selected by the U.S. military services as a supply source to quality product to the highest specified reliability level, and the company has more DLA slash sheet qualifications than any other manufacturer of space-level discrete products. Other examples of the company's commitment to rigorous testing include its radiation-hardened MOSFETs, which undergo single event effect (SEE) testing at Texas A&M University to 85.4MeV using Au ions. 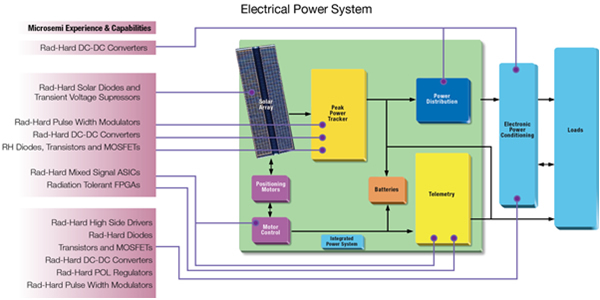 Microsemi solves problems at all stages of design and implementation, including power conversion and distribution, radio and radar signal processing, system telemetry and control, digital logic integration, and semiconductor packaging. The company is committed to helping its customers meet their most difficult space system design challenges.